Jasper Johns and Robert Rauschenberg are inextricably linked by art historians. 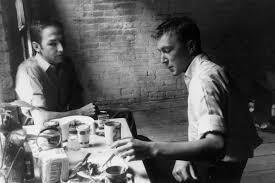 Most likely Johns and Rauschenberg were lovers. 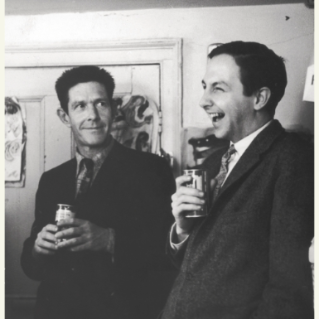 We know that they lived in the same building and socialize with each other extensively, we also know that Rauschenberg made some comments about his relationship to Jasper Johns which is pretty strong evidence that they were. They also shared the context of knowing the same performance artists, John Cage and Merce Cunningham, and they also worked together doing projects, such as window displays in New York City. 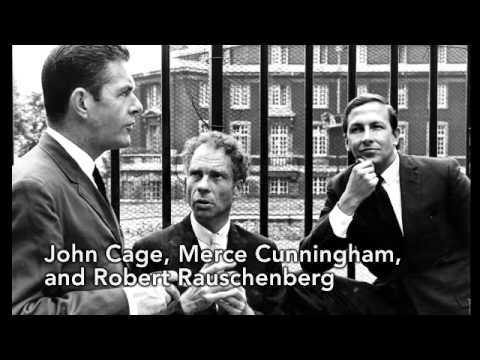 Like the abstract expressionists, Willem de Kooning, Jackson Pollock, and Franz Kline, we know that Johns and Rauschenberg socialized and hung out in the New York art scene of the 1950s. Most likely being in the right place at the right time contributed largely to all the artists above. 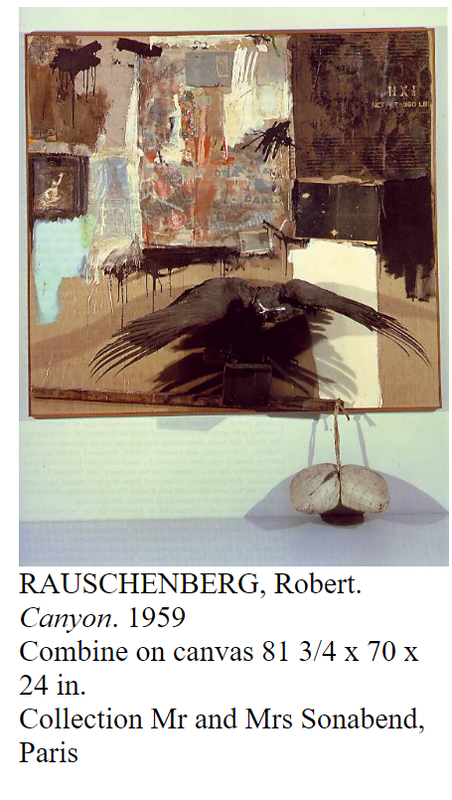 It seems very likely that Rauschenberg also helped to further Johns career by introducing him to his gallery. Many of the artist who lived in New York during the 1950s sought to make their reputations by coming up with a new type of art or technique for making art. For example, Robert Rauschenberg, used found objects and combine them together to make his “combines” that are a kind of sculptural collage. Andy Warhol also borrowed images that he changed and printed on canvas and wooden boxes. Both Rauschenberg and Warhol were major players in the style that developed at that time called “Pop Art.” The movement of Pop Art is slightly different than what the abstract expressionists were doing because the abstract expressionists were making paintings that really didn’t have a subject. As in the case of Jackson Pollock, the act of painting was called by critics “action painting.” The process of making the art was an active process that had to do with gesture and movement and very little to do with any type of representation. Pop Art is kind of an opposite to this. The so-called pop artists of the 1950s into the 1960s often took a strategy lifted from the DADA artists such as Hannah Hoch and Marcel Duchamp. Most notably Duchamp and Hoch would take printed images and collage them into works of art. Duchamp even took things like a urinal from a bathroom and placed it on a pedestal in a gallery. 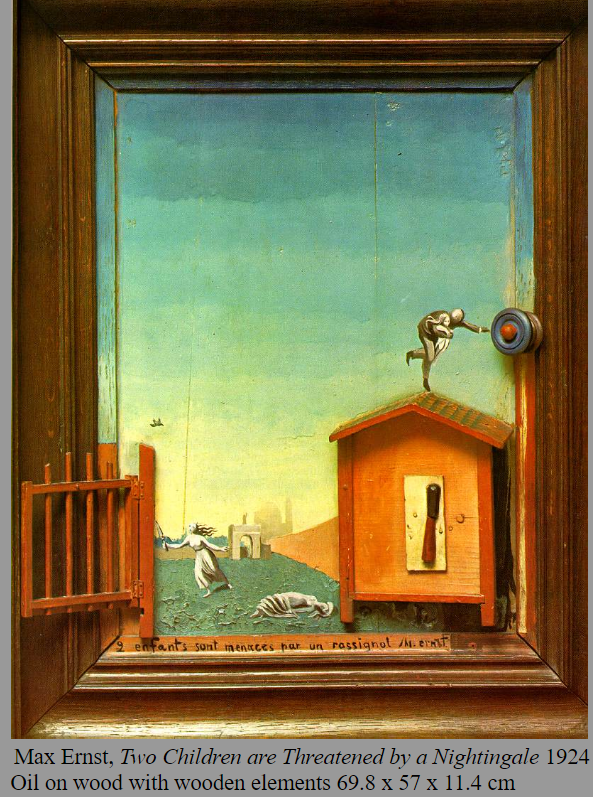 This strategy was known by Duchamp as the “ready-made,” in which you would take something from one context, such as the urinal, and by placing it in a gallery he would “recontextualize it,” which is a kind of buzzword in art history, and transform it into art by changing how it was presented. For Marcel Duchamp it was kind of a joke, however, it became a kind of gold standard in terms of how to think about art and the role of artists. The pop artists of the 1950s use this strategy of taking ready-made for preprinted things from mainstream or commercial culture and changing its meaning. Also kind of joke, but, when artists like Warhol did it with his famous painted Brillo boxes, critics described it as a criticism of American consumer culture. Essentially then pop art criticizes the art world and consumerism in the modern world of the 1950s. 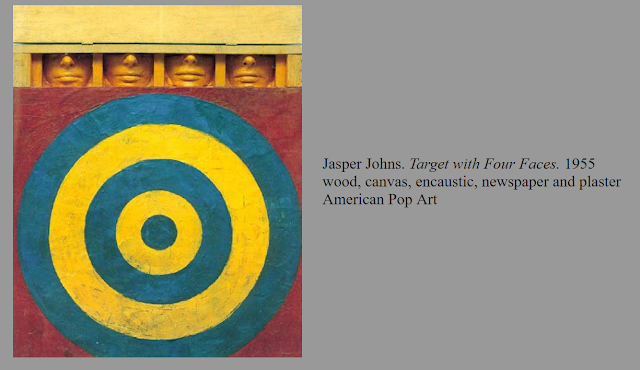 In the case of Jasper Johns, several of his works reappropriate or borrow symbols from mainstream culture and are used in a way that might change the symbols meaning. For example, Johns uses targets and flags in his work. I’ll discuss how John’s use of flags and targets might be interpreted but first it’s important to understand some things about how the paintings were made and the materials used. In most of Johns more famous works he used traditional artist’s materials from much earlier periods. In these two paintings Johns uses a type of paint called encaustic. Encaustic paint is a type of paint that was used as far back as in ancient Greece as well as during the Renaissance and Baroque periods. Encaustic is basically a medium in which pigments are added to melted wax and applied to the canvas or some other support, such as a wooden board, and when it hardens it becomes a paint layer with the particles of pigment suspended in the translucent wax. Johns also used found stuff, especially newspaper, underneath the encaustic layers. This is kind of a combination of using Marcel Duchamp’s ready-made strategy combined with ancient or Renaissance techniques. This is important because it’s one of the things that historians have used to interpret what Jasper Johns paintings might mean. In one of the paintings, which is very close to the spirit of Robert Rauschenberg’s “combines”, Johns uses some plaster casts of faces and places them within boxes above the canvas painted with a target. Analyzing the symbolism or meaning behind Jasper Johns works is kind of hard because he didn’t explain his work in any real depth. This is also kind of strategy that many artists use to make the viewer engaged with the work. In some ways one could view it as being a not very genuine way of making the work more interesting because it’s not clear what the work is about. There are various interpretations of why many of the artists from the 20th century would not or did not explain their work and you can look at the various theories or ideas by art critics and art historians that explain why they believe this is so. It is usually a matter of opinion rather than fact. What we do know about Jasper Johns is that he said he had a dream in which she saw a flag and the next day he decided to paint it. When Jasper Johns paints the American flag it’s not an actual flag, it’s a painting of a flag. In this way, he is really representing or making us think about whether or not a painting of the flag is the same as an actual flag. It’s also possible that Jasper Johns was trying to make us think about what the American flag means to us as well and or to him. By using some old-fashioned techniques such as encaustic he’s also probably making a reference to how we think about things in terms of art history and the traditions presented by art history. I phrase these things as probabilities because we haven’t been able to really get evidence from Jasper Johns as to his intentions. Most students of art history then count on the interpretations of their professors or art critics to make sense of what the painting is supposed to mean to Jasper Johns and to the audience that viewed it. 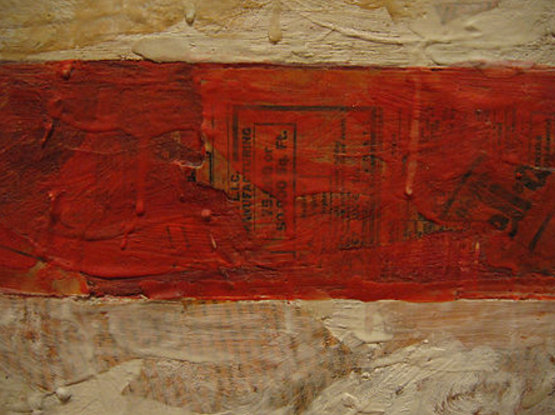 Another element that adds to the interpretation of what Jasper Johns flag paintings mean is that underneath the encaustic are layers of newspaper from that time. Several of my professors and other art historians have suggested that Johns was deliberately including the layers of newspaper as a way to suggest the history or culture behind or underneath the flag almost as if the painting was an archaeological dig. Given the interpretations better the most popular by critics and art historians, usually Jasper Johns flag paintings are interpreted as a type of symbol of America and the things that lurk underneath the surface of American culture. Again, this is not what Jasper Johns said this is how art critics and art historians have interpreted the flag paintings. Extrapolating from this, the target paintings can be seen in a similar way. 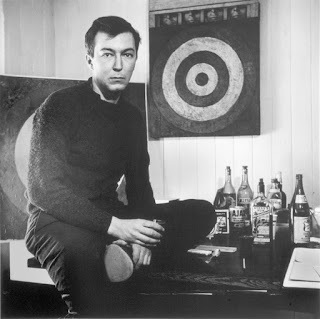 Since we don’t know what Jasper Johns intention was historians have suggested that Jasper Johns was a closeted gay man felt like a target. The layers of newspaper underneath the target again become a sort of archaeological dig into American culture and society and the small closets with plaster faces embedded in them could represent Jasper Johns feelings of being a targeted gay man who is in the closet. 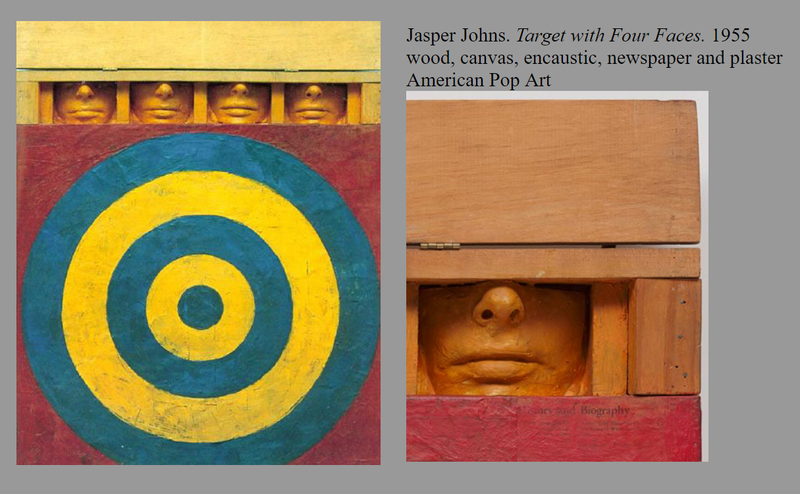 Again, these are extrapolations and interpretations suggested by others and not necessarily verified by Jasper Johns himself. Art History: Gustave Courbet, "The Burial at Ornans," 1849 oil on canvas, 51x58"
Form: Courbet's paintings are rendered in a realist and a realistic/naturalistic manner. His value structure, anatomy and color are all fairly well observed and true to life. Nevertheless, Courbet also worked with some formal elements that were less naturalistic. His color is made up of a palette of low key somber earth tones. The composition of this image is traditional but a bit odd. The grave is cropped in the center foreground and the figures stand in a frieze like band just behind the hole. The background's sky and low flat mountains are almost surreal (dreamlike) in their appearance. His paint quality is a bit unique in that he incorporates the use of impastos in his work. He employed a heavy use of the palette knife to literally trowel the paint on to the surface of the canvas. The figures in the image are realistic but they are also "types" of people and in some ways their rough and course features are almost caricature like in how they are rendered. French painter and leader of the realist movement. Courbet rebelled against the Romantic painting of his day, turning to everyday events for his subject matter. His huge shadowed canvases with their solid groups of figures ("The Artist's Studio," 1855) drew sharp criticism from the establishment. From the 1860s a more sensuous and colorful manner prevailed in his work. Courbet was born in eastern France, the son of Eléonor-Régis, a prosperous farmer, and Sylvie Courbet. After attending both the Collège Royal and the college of fine arts at Besançon, he went to Paris in 1841, ostensibly to study law. He devoted himself more seriously, however, to studying the paintings of the masters in the Louvre. Father and son had great mutual respect, and, when Courbet told his father he intended to become a painter rather than a provincial lawyer, his father consented, saying, "If anyone gives up, it will be you, not me," and adding that, if necessary, he would sell his land and vineyards and even his houses. The dreamlike paradise of the center panel gives way to the nightmare of Hell in which the excitement of passion is transformed into a frenzy of suffering. Here the lushest paradise Bosch will ever produce leads to the most violent of his always violent hells. As is generally the case in Bosch's vision of Hell a burning city serves as a backdrop to the various activities carried out by Hell's citizens, but here the buildings don't merely burn, rather they explode with firey plumes blasting into the darkness as what appears to be a wave of refugees flee across a bridge toward an illuminated gate house. The picture shows a detail of The Hell. Several huge musical instruments figure prominently in Bosch's conception of hell. They are shaped similarly to the ones used at that time, but their positioning is unrealistic (for example, a harp grows out of a lute). Their relationship to each other bears strongly fanciful elements, and they have been adapted in form. What is more, the use of these instruments is wholly fantastic. There is a human figure stretched across the strings of a harp; another writhes around the neck of a flute, intertwined with a snake; a third peers out of a drum equipped with bird-like feet, the next one plays triangle while reaching out from a hurdy-gurdy, and even the smoking trumpet displays an outstretched human arm. It is difficult to conceive that the group of damned souls would sing a hymn from the musical score fixed to the reverse of the reclining figure in front of them - although this has been proposed by some scholars. The ensemble, lead by an infernal monster, could more likely be a parody. According to Dr. Bruce Lamott, a music historian, the depiction of the individual crucified on the harp, the image of the trumpet shoved up the rear end of one of the figures, and the ears sliced by the knives could be a reference to the ideas that were being debated by the Council of Trent. Many individuals felt that music was too sensuous and the work of the devil and that the new traditions of playing music in Church was a mistake. There are also some very Giottoesque elements in this painting. In the lower right hand of hell is an image of a pig dressed in a nun's habit which obviously is a jab at the greedy nature of the Catholic Church. It is very similar to Giotto's inclusion of the Bishop who is taking money for indulgences and pardoning people in hell. Art Appreciation: What is considered good art, or quality art? I got asked this question this morning so I thought I'd post it here. I am looking at artists like Theodore Bradley or Niclas Castello for example that mimic that idea of Jean Michel Basquiat. What about those two artists is it that people say that they have great art? 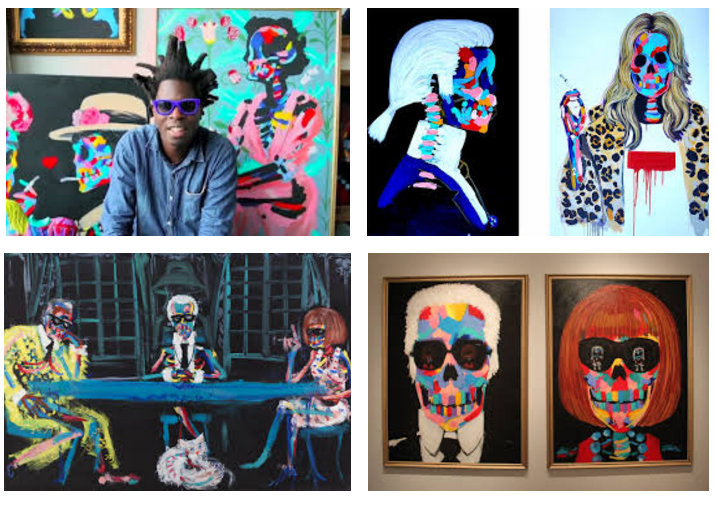 I know a lot about Basquiat but I wasn’t aware of the other two artists you mentioned so I googled them. I must say I’m not very impressed with either of them in terms of my own opinion. But it is just an opinion. So let me support my ideas and opinions with my rationale. 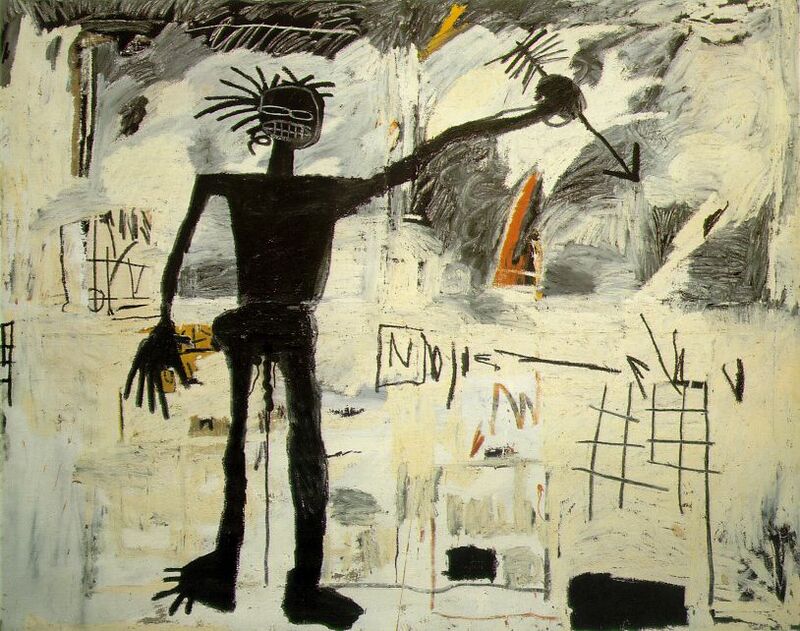 What makes Basquiat a very good artist are several things which include the physical form, the ideas in the art, and his placement in the context of the art world in the late 1970s and early 1980s. In terms of his ideas first, Basquiat was working with a lot of art historical notions such as the Gestalt or collective unconscious. He combined words images texts and even a little bit of contemporary culture in his art along with some biographical notions of who he was as a black man living in the United States. Some of the stuff has political overtones some of it is just stream of consciousness. However, the way he introduced his art to the public or the context that surrounds him is one of the things that created his acceptance and popularity in the art world. When Basquiat came on the art scene he’d already been living in New York for most of his life and was really part of the New York avant-garde. He introduced the majority of his work by making it public art as a form of graffiti that was very different from the other graffiti writers and artists of the same time. He also hung out in New York with people who were already known as important people in the art scene. All of that combined with the physical qualities of his work made him and his work popular. The physical qualities of his work really tie in with a lot of art historical ideas starting with the abstract expressionists in action painters like Pollock and deKooning. He experimented with found objects and with nontraditional art materials very much like Robert Rauschenberg and Jasper Johns. He wasn’t interested in traditional drawing skills and he also wasn’t interested in traditional representation in terms of art history from the 19th century and earlier. He embraced his awkward drawing skills and his improvisational use of art materials. I don’t think that many artists have been able to establish a reputation by a mimicking or emulating other artists without being very unique.Theodore Bradley is really mimicking Basquiat in his personal appearance and some of his content and symbols but they are really not good paintings because he is trying to draw almost realistically but doesn’t have the skill, and also unable to commit to the abstraction that Basquiat did. Niclas Castello Almost seems like he is mimicking Jeff Koons and Jasper Johns. 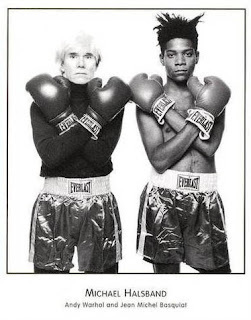 However, I don’t think he is well-known because he’s almost like a third-generation copy of the pop art movement. Of course, all of the stuff above is just my opinion based on some things that I know about art history and the art world. New Arts in Corrections opportunity for arts providers! The California Arts Council is now accepting proposals from arts organizations interested in providing arts programming to inmates at state adult correctional facilities. Questions regarding the RFP must be submitted by February 27 at 5:00 p.m. PST. The final deadline for proposals is March 26 at 5:00 p.m. PST. Get the details in our press release. Don't miss your chance for state arts funding! CAC grant programs deadlines are just around the corner! Details and deadlines for all of our offerings are here. If you've applied in the past and were not selected for an award, don't be discouraged - refer to your panel notes, speak with our knowledgeable Programs staff, and make use of our online resources. It's tax time! Be a champion for arts education when filing by making a contribution to the Keep Arts in Schools Fund. 100% of your tax-deductible contribution is applied to arts education programming supported by the California Arts Council. Get the details on how to donate here. The National Endowment unveiled its first two major grant announcements for fiscal year 2018 on Wednesday. Awards included $3,363,000 for California organizations for 132 grantees across the state. Read more here. We're putting the social media spotlight on the great work of our grantees! Every week on Instagram, we'll post a new pic with the hash tag #Instagrantee. Find us and follow us at @calcartscouncil.